Kia Motors America said that last month's certified pre-owned sales marked its best April ever and more than a 5-perecent increase. And this, right after Kia had its best first quarter ever for CPO. Last month, Kia sold a 6,953 vehicles, which was up 5.6 percent year-over-year. CPO sales have risen 14 percent year-to-date, reaching 26,406 units, according to Autodata Corp.'s April CPO retail sales report. "Kia's record CPO sales are not surprising when you consider Kia offers the longest powertrain coverage, excellent financing incentives and a strong inspection process," IntelliChoice director of data products Eric Anderson said in a news release. "This is why IntelliChoice awarded Kia the best popular brand CPO program." Kia’s CPO program only accepts Kia vehicles that are five years old or newer with less than 60,000 miles, according to KMA. Each vehicle also undergoes a 150-point quality assurance inspection by certified technicians. Additionally, KMA said all Kia CPO purchases come with a 10-year/100,000-mile powertrain limited warranty and 12-month/12,000 mile Platinum Coverage. When it comes to used-car prices, the sky might not be falling after all, if indications from a Manheim report bear out. The auction company’s index measuring used-car prices increased for the first time all year, and the used retail market buzzes along at a solid clip. The Manheim Used Vehicle Value Index came in at 124.7 in April, which was up 1.6 percent year-over-year. According to a report accompanying the index, wholesale prices climbed 0.5 percent from March on a mix-, mileage- and seasonally adjusted basis. In an analysis accompanying the index, Cox Automotive chief economist Tom Webb downplayed the concern many analysts have expressed about used-car price declines. Edmunds executive director of industry analysis Jessica Caldwell echoed some of that new-car inventory concern in monthly sales day comments provided by the company. Another one of the indices measuring wholesale vehicle values has seen its first increase in 27 months. While the April reading of Black Book’s Used Vehicle Retention Index (113.1) was just a hair above March’s (113.0), it’s at least a temporary pause to the gradual downturn that has been ongoing since January 2015. The index, which is based on Black Book wholesale average values on 2- to 6-year-old vehicles, was at 126.8 that month before sliding for more than two years. “April saw stronger seasonality trends than what we had been seeing during the last few spring seasons,” Black Book’s Anil Goyal said in a news release accompanying the monthly Used Vehicle Retention Index. Spring has been more robust than anticipated, and the strength in car retention has been encouraging, says a spokesperson for the company via email when asked for Goyal's take on whether April was temporary relief or an encouraging sign. However, prices are likely to move back into the usual summer depreciation, the spokesperson said. Moving over to retail, Webb — citing data from NADA — said that used-vehicle retail sales (including private sales) climbed 3.6 percent in the first quarter, with dealer sales up even more (5 percent for franchised, 5 percent for independents). In late April, Edmunds was forecasting 3.6 million used-car sales for the month, up from 3.4 million in March, with a SAAR of 38.4 million for both months. Meanwhile, ALG was forecasting 3.32 million used-car sales for April, which would have been off 0.8 percent year-over-year. Along with sharing some of its first-quarter sales and loss projections, online used-vehicle retailer Carvana late on Thursday announced the pricing of its initial public offering of 15 million shares of its Class A common stock at a price to the public of $15 per share. The company said in its latest filing with the Securities and Exchange Commission that the action should yield proceeds of approximately $210.7 million or $242.0 million if the underwriters exercise their option in full to purchase additional shares of Class A common stock. The shares began trading on the New York Stock Exchange on Friday under the symbol CVNA. The offering is expected to close on May 3, subject to customary closing conditions. "We are honored to celebrate this milestone with our employees who have worked so hard to help us build a great car buying experience for consumers," Carvana chief executive officer and co-founder Ernie Garcia said in a news release. "We're excited for our future, and what it holds for our company and millions of car buyers across the country," Garcia added. Carvana has granted the underwriters a 30-day option to purchase up to 2,250,000 additional shares of Class A common stock. Wells Fargo Securities, LLC, BofA Merrill Lynch, Citigroup Global Markets Inc. and Deutsche Bank Securities are acting as joint book-running managers for the offering. Robert W. Baird & Co., William Blair & Co., BMO Capital Markets Corp. and JMP Securities are acting as co-managers. “We estimate, based upon an assumed initial public offering price of $15 per share (which is the midpoint of the estimated public offering price range set forth on the cover page of this prospectus), we will receive net proceeds from this offering … after deducting estimated underwriting discounts and commissions but before deducting estimated offering expenses payable by us,” the company said in the SEC filing. “We intend to contribute the net proceeds to our wholly owned subsidiary, Carvana Sub, that will in turn acquire 18,750,000 newly-issued LLC Units (or 21,562,500 LLC Units if the underwriters exercise their option in full to purchase additional shares of Class A common stock) in Carvana Group,” the company continued. “In turn, Carvana Group intends to apply the net proceeds it receives from us to repay all outstanding borrowings under the Verde Credit Facility, to pay expenses incurred in connection with the organizational transactions and for general corporate purposes,” the company went on to say. “Carvana Sub will also transfer approximately 170,000 LLC Units to Ernest Garcia, II (assuming an initial public offering price of $15 per share, which is the midpoint of the estimated public offering price range set forth on the cover page of this prospectus) in exchange for his 0.1 percent ownership interest in Carvana,” the company added. As previously mentioned, Carvana revealed some of its expected performance metrics from the first quarter. During the three-month span that concluded on March 31, the online retailer said in the SEC filing that its projected retail sales would fall between 8,250 and 8,350 units. In the year-ago quarter, Carvana indicated its retail sales totaled 3,783 units. Carvana attributed the sales growth in part to its market growth. The company operated in 11 markets during the first quarter of last year and in 23 markets in the opening quarter of this year. “This increase in unit sales was also driven by growth in existing markets due to expanded inventory selection, enhanced marketing efforts, increased brand awareness and customer referrals,” Carvana said in the SEC filing. The growth in vehicle turns pushed Carvana’s expectation for total net sales and operating revenues to be between $157.3 and $159.3 million, as compared to total net sales and operating revenues of $73.0 million in Q1 of last year. “The increase in total net sales and operating revenues was primarily the result of the increase in unit sales,” the company said. And perhaps the metric that might pique the interest of much of the used-vehicle industry, Carvana said it expects Q1 total gross profit to be between $9.3 million and $9.8 million, as compared to total gross profit of $4.0 million in the year-ago period. “The expected increase in gross profit is primarily due to increased unit sales and increased used vehicle gross profit per unit, which was primarily driven by enhancements in our proprietary vehicle purchasing, pricing and logistics technology,” the company said in the SEC filing. Despite that gross profit jump, Carvana acknowledged that total net losses are projected to rise year-over-year. For the first quarter, the online retailer said in the SEC filing that its total net loss should be between $39.3 million and $38.3 million, as compared to total net loss of $17.3 million for the three months of 2016. “The expected increase in net loss is primarily due to an increase in selling, general and administrative expenses associated with expansion to additional markets and investment in infrastructure and headcount to support our growth,” Carvana said. Kia Motors America's certified pre-owned vehicle sales program achieved a record-high first quarter, having sold a total of 19,453 units. Along with several other automakers, last year was also a best-ever CPO year for Kia, selling a total of 76,224 units in 2016. "Kia's sales boost is reflective of the confidence that comes with buying a vehicle that has passed a rigorous inspection and helps consumers establish a long-term relationship with the brand," the Seoul-based automaker said in a news release. According to Autodata’s March CPO retail sales report, Kia continues to outdo the industry with an overall notable 17.3 percent increase year-over-year for Q1. In an Auto Remarketing report from January, Maria Williams, Kia's senior CPO retail support manager, said Kia's certified sales have climbed each year since the automaker partnered with JM&A Group to help build its certified pre-owned program. Kia’s program administered by JM&A Group only accepts vehicles up to five years in age with fewer than 60,000 miles on the odometer and every vehicle undergoes a 150-point Quality Assurance inspection by certified Kia technicians. According to Williams, the program with JM&A Group was launched in 2008, and is targeting another growth year in 2017. Additionally, Kia's CPOs also come with a 10-year/100,000-mile powertrain limited warranty as well as 12-month/12,000 mile-Platinum Coverage, according to KMA. "Certified pre-pwned vehicle programs tap into the best attributes from both the new and used worlds," Edmunds executive director of industry analysis Jessica Caldwell said in a news release. "For consumers who might be uneasy about buying used, CPO vehicles offer lower prices than a new car coupled with a warranty that provides peace of mind about wear and tear." Penske Automotive Group posted a used-vehicle performance lift during the first quarter thanks in part to the addition of U.S.-based CarSense and U.K.-based CarShop, both of which are stand-alone specialty retailers of used vehicles. During Q1, Penske reported these used-vehicle dealerships retailed 8,200 units, generating $143.1 million in revenue and $24.6 million in gross profit. The average transaction price was $14,372, generating a gross profit per unit of $1,382. Finance and insurance gross profit per unit was $1,147. All told, according to the financial statement Penske released on Wednesday, the dealer group retailed 62,284 used units during the first quarter. A year earlier, the figure came in at 52,741 units. On a same-store basis, however, Penske sustained a slight softening in used-vehicle retail sales as that metric was 51,852 units. Gross profit on used retail sales on a same-store basis also ticked a bit lower year-over-year as Penske reported the Q1 figure at $1,549, down from $1,601 a year earlier. However, F&I gross profit per unit improved a bit year-over-year when looking at the same-store data, edging up to $1,123 from $1,066. Overall, Penske reported that its first quarter included record revenue, income from continuing operations and earnings per share. The dealer group said Q1 income from continuing operations attributable to common shareholders increased 4.9 percent to $83.2 million, and related earnings per share increased 7.8 percent to $0.97, when compared to the same period last year. Penske acknowledged foreign exchange negatively impacted income from continuing operations attributable to common shareholders by $7.5 million, and earnings per share attributable to common shareholders by $0.09. Excluding the foreign exchange impact, the company explained income from continuing operations attributable to common shareholders would have increased 14.4 percent to $90.7 million and earnings per share would have increased 17.8 percent to $1.06. The company added total revenue increased 5.3 percent to $5.1 billion, but same-store retail revenue declined 2.2 percent. Foreign exchange rates negatively impacted revenues by approximately $287.6 million. Excluding the foreign exchange impact, total revenue would have increased 11.3 percent to $5.4 billion and same-store retail revenue would have increased 3.7 percent, according to the company. Penske Automotive Group chairman Roger Penske said, “Our diversified transportation services business delivered another outstanding quarter of record results despite foreign currency headwinds. I am pleased to see increases in average gross profit per transaction for new vehicles, used vehicles and finance and insurance when excluding the impact from foreign exchange, coupled with another strong quarter of record results by our U.K. business. “As we look to the future our recent acquisitions combined with the continued performance of our existing business provide a solid foundation for growth and profitability,” he went on to say. AutoNation chairman and chief executive officer Mike Jackson is confident two of the most important used-vehicle performance metrics — volumes and gross profit per unit — will both improve during the second quarter. According to AutoNation’s first-quarter figures shared on Tuesday, the dealer group reported gains in retail volume but softening in gross. As a whole, AutoNation retailed 60,608 used vehicles in Q1, up by 2,505 units or 4.3 percent year-over-year. When looking on a same-store basis, the retail figure improved slightly more; up by 5.7 percent as those operations moved 59,131 units. The gross profit on those units is where AutoNation took it a bit on the chin in Q1. Overall, AutoNation said its gross profit on used-vehicle retail sales dropped by $377 or 23.4 percent to settle at $1,236. The same-store metric was about the same, sinking by 23.8 percent or $389 to come in at $1,243. “During the first quarter, we saw increasing used unit volumes as we focused on our One Price strategy, which is now fully rolled out at all AutoNation stores, and worked through the majority of the inventory that was previously on recall hold,” Jackson said in a news release. “We expect to see a sequential increase in the second quarter in both used unit volumes and gross profit per vehicle retailed,” he continued. Looking at the top-line performance, AutoNation reported Q1 net income from continuing operations came in at $98 million, or $0.97 per share. A year earlier, it was $96 million, or $0.90 per share. The dealer group added that its Q1 revenue of $5.1 billion and gross profit of $820 million were relatively flat compared to the year-ago period. Also of note from AutoNation’s Q1 report, the dealer group indicated that its overall F&I gross profit per unit also stayed nearly flat year-over-year, coming in at $1,625. Furthermore, AutoNation retailed 75,798 new models during Q1; an amount off by 3,209 units or 4.1 percent year-over-year. After articulating various points about what he’s so upbeat about the dealer group’s used-vehicle department current and future performance, Lithia Motor president and chief executive officer Bryan DeBoer staunchly defended how the company is fending off what the investment community is seeing as would-be challengers that operate solely online. He continued by saying, “I really believe that auto retailers have built a model that’s an end-to-end solution, where it’s a living room to living room model. We have applications, we have websites, and we have the inventory to do that and we do it at a profitable level, an extremely profitable level. “And I think when you start to think about sector killers, or people that could modify what the used car model is, I think you need to go back and look at what’s occurred in those segments and understand that auto retailers and especially Lithia Motors that is very adept at selling used vehicles that’s built into who we are and has been built in for the last decade or so,” DeBoer went on to say. “And I think most importantly, remember, the top of the food chain is the new car trade-ins, OK. And that’s something that used car retailers aren’t at liberty to have, which is what creates that waterfall effect,” he added. Certainly Lithia could end up with a sizeable amount of trades since the dealer group reported that it retailed 35,616 new models during the first quarter, representing an 8.8-percent lift year-over-year. DeBoer noted that if a Lithia store doesn’t have particular pieces of used inventory that managers deem to be necessary, he’s encouraged by the opportunity to procure those units via wholesale channels. “The past half-decade of results have been stunted by the lack of vehicle supply, a trend which is finally reversing,” DeBoer said during his opening remarks. DeBoer also mentioned that Lithia likes to keep between one and two months’ worth of used inventory at its stores. He believes that’s the correct level to push each store toward the goal of retailing at least 75 used vehicles each month. Lithia certainly has been active on the acquisition front during the past couple of years, including the procurement of DCH Auto Group in the summer of 2014 and then the Carbone Auto Group last September. DeBoer did more than hint that the company is far from done expanding its footprint. “I think when we think about acquisitions at Lithia Motors, this is something that perpetuates in each and every leader in the organization, here in Medford or in the stores,” DeBoer said. “It’s a day-to-day process that each of us are looking for growth opportunities. DeBoer pointed out that the amount of cash Lithia generates annually — $200 million to $300 million — gives Lithia the flexibility to make the moves it chooses. Furthermore, he said Lithia is seeing synergies of blending together its portfolio of stores. However, the Lithia boss reiterated that it’s an ongoing process. Another hot topic DeBoer addressed stemmed from incentives being slapped onto new-vehicle deliveries. 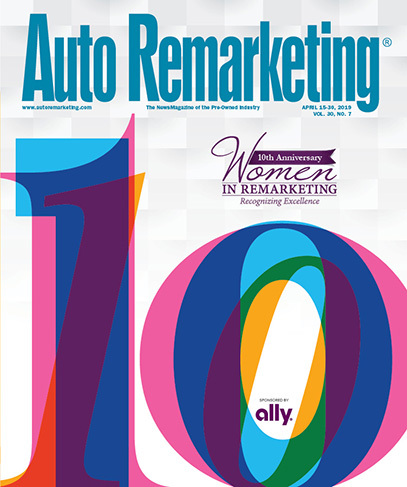 Auto Remarketing highlighted the recent analysis from Kelley Blue Book and ALG that mentioned average incentive figures above $3,500 in March. DeBoer didn’t sound an alarm about what cash is being slapped on the hood or other carrots automakers might be using to get consumers into a new vehicle. “I think we are not seeing large changes or any type of scenarios that we believe in the next coming quarters are going to change dramatically,” he said. “We typically see pretty stable incentives throughout the summer months. As we begin to move into the fall is when incentives start to accelerate. Fueled in part by its used-vehicle department performance, Lithia Motors reported the highest first quarter revenue and earnings per share in company history. To get to those achievements, Lithia said on Wednesday that its used-vehicle retail same store sales increased 6 percent as the dealer group turned a total of 30,783 units during Q1, representing a year-over-year lift of 3,352 units. That used volume gain helped to overcome deterioration in gross profit per unit. Lithia reported that its gross on used retail sales dipped by $109 year-over-year to $2,234. Also helping the company cause was Q1 F&I gross profit ticking up $17 compared to the same time period a year ago to land at $1,307. However, it’s the top-line metrics that prompted Lithia leadership to cheer. The company said its Q1 unadjusted net income per diluted share increased 30 percent year-over-year to $2.01 from $1.55. Adjusted net income per diluted share increased 15 percent to $1.78 from $1.55. Lithia’s Q1 unadjusted net income increased 26 percent to $50.7 million from $40.3 million. Adjusted net income increased 12 percent to $45.0 million, up from $40.4 million. The company went on to highlight its Q1 revenue jumped 13 percent to $2.2 billion from $2.0 billion. “Through a disciplined acquisition strategy and strong operational execution, we’re pleased to report our 26th consecutive quarter of record earnings per share,” Lithia president and chief executive officer Bryan DeBoer said. “We grew revenue 13 percent and adjusted earnings 12 percent over last year and a significant number of stores still have ample opportunity to improve. Lithia’s expectations are for its used department to maintain the pace it set during the first quarter. The company’s guidance projects used-vehicle same-store sales increasing 5.5 percent and used-vehicle gross margin to come in at 11.5 percent to 11.7 percent. Also of note on the used side, Lithia wholesaled 10,840 units during the first quarter, up by 1,327 units or 13.9 percent year-over-year. The average selling price for those wholesaled units softened by $252 to settle at $6,596. Pre-owned Tesla Model S vehicles sell notably faster than some of its U.S. counterparts’ best-selling used models, according to Autolist. The firm recently released a study that delved into used Tesla vehicles’ overall market performance relative to those of General Motors and Ford. The pre-owned Model S averages 87 days on market, 5 percent below its peer group, reports the buyer intelligence firm’s study titled, Changing of the Guard: Tesla vs GM & Ford. That peer group includes the Audi A7, Porsche Panamera, BMW 6 Series, Mercedes-Benz CLS, and Lexus LS 460. The top used models from GM and Ford — the Ford F-150, Chevrolet Silverado 1500, Chevrolet Malibu and Ford Fusion — spent between 88 days and 104 days on the market. Additionally, the Model S also has higher pre-owned prices relative to expectations than top-performing GM and Ford vehicles. Prices of the Model S have trended between 3 percent and 5 percent above expectations for the past year. To compile this study, Autolist’s analysts took a look at more than 10 million vehicles from April 2016 to January. “One thing important to understand about our study is — why we think its impactful — is because it’s a comparison relative to a peer group. And that’s a really important element of this analysis because if you’re just comparing raw numbers overall, you can control a cross segment,” Alex Klein, vice president of data science at Autolist, said in a phone interview with Auto Remarketing. With the next Tesla model — the Model 3 — set to debut later this year, Klein said the brand's performance in coming years could be determined by the reception of this model, which would be its first mass-market vehicle. According to a J.D. Power report released last month, drivers who purchase the brand’s lowest-price sedan are less likely to be comfortable with any technology-related snags. He said Tesla customers are likely to become interested in buying EVs over the long-term, which again has benefits for Tesla, but could also have benefits for other EVs on the market in the future, too. “When you are buying a Tesla you are buying a next-generation automobile. There’s a perception that people are pushing the bounds of technology and they are being part of the forerunners of next-generation technology whenever they step foot in a Tesla,” Klein added. The American International Automobile Dealers Association reported that average length of time a new model sat on a dealer’s lot hit 70 days in March — the longest stretch of time since July 2009. Edmunds contends current new-vehicle inventory levels haven’t been this high since 2004. Cox Automotive chief economist Tom Webb sees the assertions from AIADA and Edmunds stemming from franchised dealers starting both February and March with more than 4 million new units in stock as a headwind for both used- and new-vehicle sales. Webb explained that hefty incentives were applied to that new-model inventory — a move that eventually places pressure on used-vehicle values — and the industry achieved a seasonally adjusted annual selling rate (SAAR) of 17.5 million in February. The strategy repeated in March, but the new-model SAAR fell to 16.5 million — the lowest reading since February 2015. “Last month’s weak sales pace, plus less-than-needed production cuts, has left dealers with still too much new metal on the ground,” Webb said. During his last quarterly conference call, Webb elaborated about where he thinks a healthy new-vehicle sales pace can be that leaves the used-vehicle segment with plenty of retail room to maneuver. “I think if you look at it from a very long, long trend what you might term the underlying demand for new vehicles — the current vehicles in operation plus scrappage — I don’t think it’s that much north of 16 million going longer term. So the SAAR at some point has to move down below 17 million. But again it’s dependent upon what real retail demand there is out there,” Webb said. “The fact that dealers have 4-plus million new vehicles in stock is the pressure on used-vehicle values. Obviously that’s too many,” he reiterated. While used-vehicle production certainly can be attributed to situations such as trade-ins and off-lease returns, Webb acknowledged automakers have difficult challenges in managing factory production. “A production adjustment has to be made with the sales pace in March being a disappointment,” Webb said. “We didn’t make a lot of the progress in terms of getting new-vehicle inventories in line. There’s still an overhang. To the extent the manufacturers produce to demand, then you don’t have that downward pressure on used-vehicle values. To a certain extent, I’m still hopeful that is what they will do. “I’m somewhat surprised they’ve left their dealers holding that much inventory for such an extended period of time now rather than adjust,” he went on to say. “I know some of it has to do with imbalances and production schedules etc. But still, it is not a good thing for them since they also hold the residual values on 10 million leases out there. “It’s not good for the manufacturers and it’s certainly not good for the dealers,” Webb added. Manheim reported the average price for rental risk units sold at auction in March remained down 3 percent year-over-year. Webb explained prices were up relative to February, but less than the normal seasonal pattern would indicate. Webb went on to note that a straight average of auction pricing for rental risk units in March represented a 3.5-percent rise from a year ago, “reflecting a better mix of market classes and lower mileage.” He added that SUVs and CUVs accounted for 33 percent of rental risk sales in March of this year versus only 25 percent last March. The share accounted for by compact cars fell from 29 percent to 25 percent. Manheim also pointed out that average mileage for rental risk units in March (36,800 miles) decreased by 10 versus a year ago. Webb also touched on how the best of off-rental units aren’t necessary being skimmed off by rental car companies and being wholesaled other places than having those units come down the lanes. “There was fear as the rental car companies used non-auction channels — direct to dealer sales and retail customers — that the auctions would end up with the higher mileage poor condition vehicles, the less desirable vehicles. But that has not been the case,” Webb said. “I watch it very closely with the types of vehicles that come through our auctions and the condition levels. We’re not skewed in any way along those lines so that’s heartening,” he continued. Meanwhile as those new-vehicle inventories pile up, Webb pointed out that OEMs aren’t falling back into previous practices by sending more units into the fleet space. Manheim determined that the combined rental, commercial fleet and government purchases of new vehicles decreased by 13 percent year-over-year in March, with the “all-important” rental segment down the most at a 14 percent decline. “Granted, that was relative to a very high level a year ago,” Webb interjected. “Certainly in the way past, basically when you had a lot of program cars, that was an avenue,” he continued. “Even when the manufacturers had ownerships in the rental car companies, you could use that as an avenue to keep factories open. And what about rental car companies working deals with the automakers?